I've always classified myself as a cat person. I love cats. I grew up with cats. My husband and I have adopted many cats. Cats get me! And while we had dogs growing up and while I loved them just as much as their feline counterparts, cats were always my thing. My cats are my babies, they are my family. I talk to them, I ask their opinions... And when my beautiful 10-year-old calico cat Mona Lisa passed away suddenly almost a year-and-a-half ago, I was devastated. To be honest, I still cry when I think of her or when those dreaded Facebook memories pop up. My husband, being an avid dog lover (and a converted cat lover, thanks to me) has been begging me to get a puppy. It's not that I didn't want one, I've just been hesitant as I know a puppy needs your undivided attention. Cats are different - they do their own thing, they don't need your approval or your constant attention. And while our cats (both rescues) get showered with love, we understand that they also need their space. And that's fine... they know we love them, and we know they love us. But dogs; dogs are a different ball game. (Literally, they love ball games!) Dogs want you around. They want to be around you. They demand your attention. 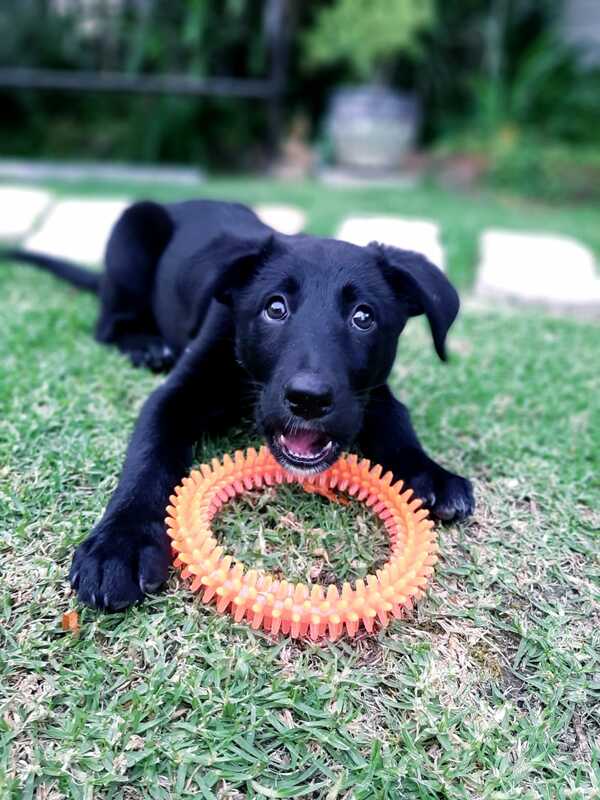 I finally 'gave in' in December last year when we decided to adopt Jack, a border collie, labrador cross puppy who needed a home. And honestly, the best decision ever! That little pup has brought so much sunshine into our home. He is the most amazing bundle of joy. It's like we light up his life every time he sees us... and he surely lights up ours. Nothing makes me feel better after a rough day at work than coming home to that puppy with his tail wagging at 100 wags a second! It's like free therapy. Having Jack, has also forced us to be more active. We take him for walks on the beach or strolls in the Botanical Garden. We spend a lot more time outside (he loves playing catch) and we take drives in the bakkie just so he can enjoy the wind! And while it took our cats a while to adjust to this little terror in their midst, seeing them play together or sleep in the same spot is absolutely heartwarming. PS. We also have 30+ tropical fish; they don't give us much affection! Jack Black, aka Jack in the Box!